If you are lucky enough to be in Tebaya's delivery zone, run to your computer, open up Seamless Web, and do yourself a big favor. These are some of the best wings you will ever eat. I've heard several people who didn't even think they liked wings, wax poetic on these little pieces of soy sesame chicken heaven. Now the wings would be enough on their own, but they also have the most amazing chicken sandwiches. This is coming from someone who doesn't usually like chicken sandwiches. The Karaage comes with a double stack of slightly sweet, crunchy, battered chicken while the Katsu has a single layer of savory, crunchy battered chicken with some lettuce and secret sauce. 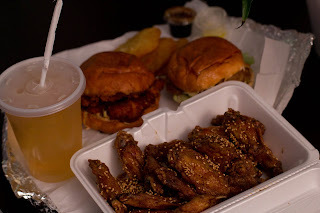 The Katsu is my personal favorite, but I think this is going to come down to personal taste since they are both filled with amazingly moist and tender flavorful bird- so go ahead and order both and conduct your own personal taste test. The Mr is also obsessed with the Potemochi which are sort of potato pancake like things with a mochi texture. This sounds like something I should go nuts for, but I find them a bit too oily. If oily doesn't bother you, go ahead and throw in an order of them too.